Trent Nelson | The Salt Lake Tribune Utah Valley University graduates walk through the school's Hall of Flags at the beginning of commencement in Orem, Thursday, April 28, 2016. 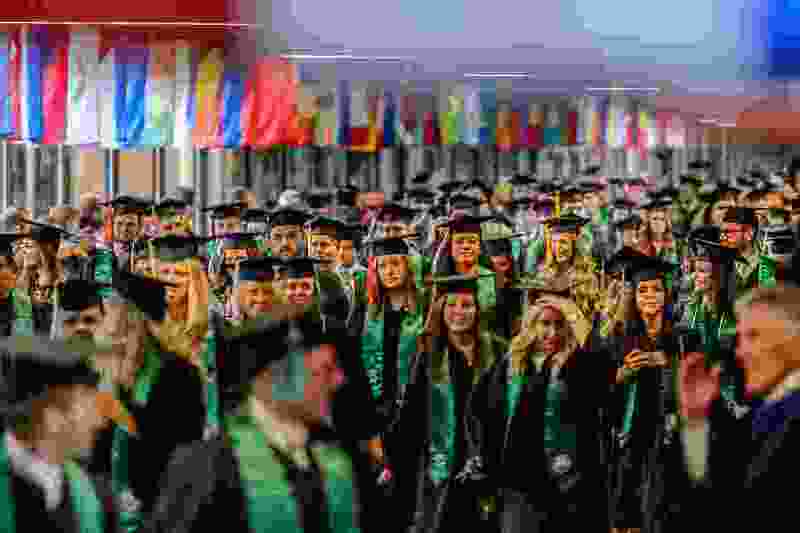 UVU awarded 5,409 degrees at its 75th commencement. An educated workforce is crucial. Utah’s economy is surging, employers are desperate for talent and demand for college-educated workers is higher than ever. We know the returns of a college education to both the state and the individual are enormous. According to a report from the Utah System of Higher Education, a Utahn with a bachelor’s degree earns nearly 70 percent more than a Utahn with only a high school diploma. In addition, for every dollar invested in higher education, Utah saw three dollars returned in increased income tax revenues for the state. Yet only two-thirds of our high school students are going on to college within five years. If the economic success of our state is to continue, it is imperative that we increase the pipeline of students going on to college, and especially to reach those who might not otherwise consider college for their future. With the future of our state depending on increased educational attainment, the question becomes, how do we get more Utah high school students to choose to go to college? One proven way of getting more high school students in the door to higher education is to provide them a point-person — a college access advisor — housed full-time in their high school, who helps them navigate the college admissions and financial aid process. By being informed of all the options available to them — whether it be a certificate, associate degree, bachelor’s degree, or more — students are more likely to take advantage of the many postsecondary educational opportunities Utah has to offer. For the 2019 legislative session, the Utah Board of Regents has prioritized an initiative that will provide a college access advisor for every high school in Utah. This full-time, permanent advisor will help students with ACT registration and preparation, college applications, financial aid and scholarships and a connection to their college campus. This initiative is an expansion of the Utah College Advising Corps, a program run by the University of Utah since 2007 that has proven to be effective at increasing college enrollment rates. In fact, high schools with a college access advisor can anticipate a 5 to 9 percent increase in the college enrollment rate of their graduates. To show its commitment to this program, the Office of the Commissioner of Higher Education has reprioritized $1 million of existing dollars to fund an initial expansion. From Weber to Washington County, 33 high schools will have college access advisors on the ground, full-time, by fall of 2019. The first phase of this expansion is an exciting step to making sure we scale up this program in a sustainable way. The Board of Regents is looking forward to taking this initiative to the state legislature this session and is asking for a $6 million investment from the state to make this proven model available to every high school student in Utah. Once the program is statewide, Utah can expect a 16 percent return on investment in the form of tax revenues resulting from increased wages. By supporting this initiative, the state is quite literally investing in our future. Utah will be the first state in the nation with a comprehensive college access advising program. This expansion is a compelling way to lead out on one of the most pressing issues of our time: getting the educated population Utah needs to continue our economic success. Harris H. Simmons is chair of the Utah State Board of Regents.